Arthur Forse was born in 1881 at Stoford, just south of Yeovil, the son of grocer George Forse and his wife Mary Ann Pitman. In the 1891 census Arthur was living at home in Barwick with his parents and five siblings. By the time of the 1901 census the family had moved to 7 Silver Street, living above the coffeehouse that Arthur's mother and sister Rosina kept. While his father was now working as a leather dresser, Arthur was listed as a leather glover. In the summer of 1910 at Yeovil Arthur married Yeovil-born Mabel Amanda Arnold (1882-1959), the daughter of George Arnold (1832-1919) and Mary Ann née Lewis (1839-1931).They were to have one son, Graham Arthur Arnold Forse (1922-2000) and a step-daughter, Gladys Arnold. In the 1911 census Arthur, Mabel and Gladys were living at 65 West Hendford. Both Arthur and Mabel were working in the gloving industry, Arthur as a lining cutter and Mabel as a machinist working at home. Within a few years Arthur and Mabel moved to 15 Percy Road where Arthur set up his own small glove manufacturing business. The company was listed as Arthur Forse, glove manufacturers of 15 Percy Road (with the telephone number 43) in the 1935 and 1939 editions of Kelly's Directory and as A Forse Ltd, glove manufacturers of 13 & 15 Percy Road in Edwin Snell's Directory of 1954.However, by this time Arthur had died. In 1952 Arthur and Mabel were living at 2 Glenville Road but on 18 July of that year Arthur died at Yeovil District Hospital. 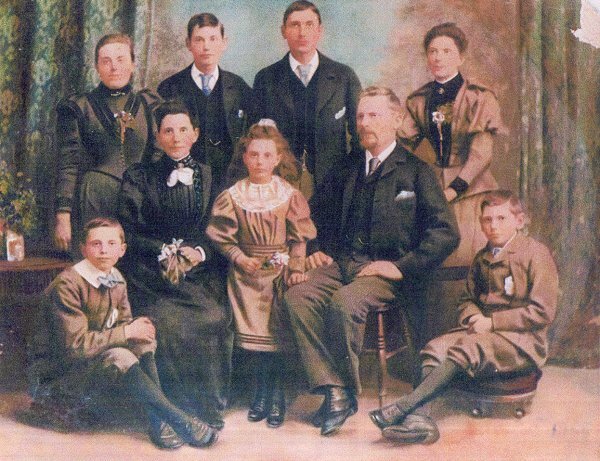 George and Mary Ann Forse and their family, in a hand-coloured photograph of 1894. Many thanks to Martin Lucas, great, great grandson of George and Mary Ann, for the following notes on the photograph. Sidney Robert (my great granddad - married Frances Isabella Andrews, daughter of John Henry Andrews, blacksmith of Stars Lane. Granddaughter of Thomas Gale stone mason of Middle Street and John Andrews, coal dealer of South Street. Harry and Kate née Stroud (this picture shows their wedding day 1894). Sadly Harry passed away in March 1901 aged just 28. Mary Ann and George with Beatrice between them. That leaves Arthur, seated bottom right, who married Mabel Amanda Arnold in 1910. Taken about 1960, this photograph of Silver Street is taken from the top churchyard steps. The row of shops at right have all disappeared with the building of the Quedam shopping centre. The entrance to Vicarage Street, another casualty of the Quedam, is just visible at centre, to its immediate right is the tea shop run by Arthur's mother and sister at the turn of the century and where the family lived over the shop. 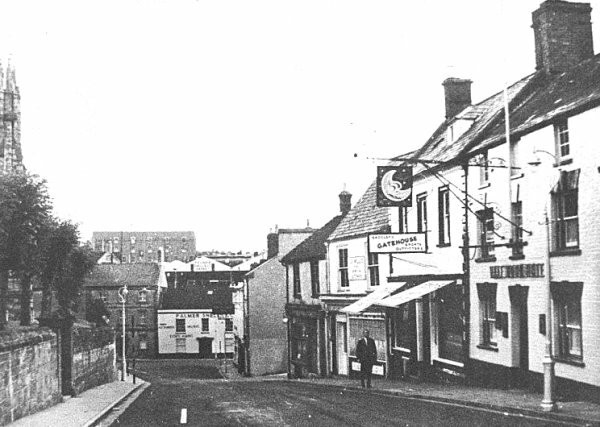 At extreme right is the Half Moon Hotel.